Traveling is rarely easy and it can deter a lot of people from actually wanting to travel because of the hassle they have to go through. From catching connecting flights, hustling through airports, and hauling down taxis, sometimes it’s easier to just do a stay-cation instead of journeying to the ends of the earth to enjoy some time away from reality. However, you shouldn’t spend your vacation vegging out on the couch. Take the time away from work and the kids to really spend some time relaxing and thankfully with our airport transportation services we can accommodate you. Rarely do people experience smooth traveling plans these days. Dealing with cantankerous airport workers, lost luggage, and late airport transportation services can all attribute to a bad start – or end – to a vacation. However, what if we told you that we could make a portion of your traveling experience easier? One way we can help you eliminate travel anxiety and unnecessary annoyance is by hiring a premier airport car service in Cincinnati, OH. 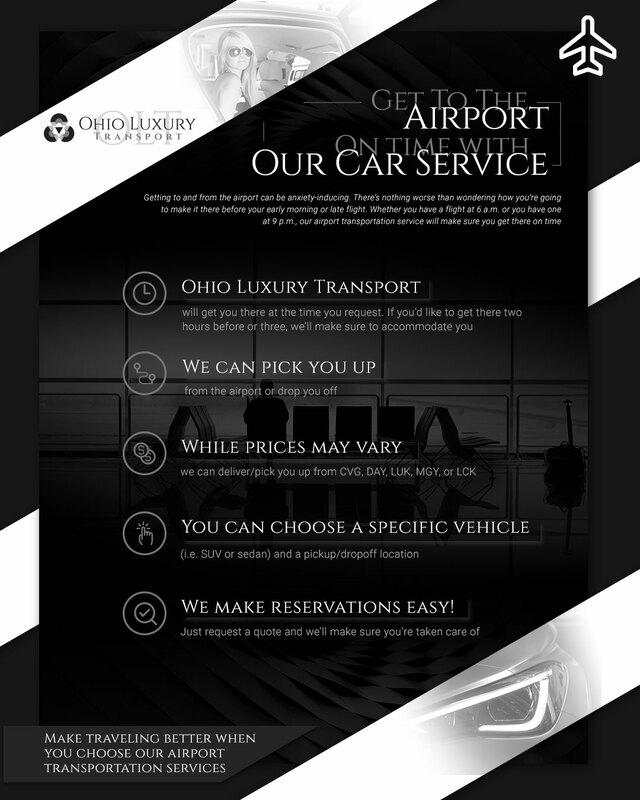 Ohio Luxury Transport is an airport transportation service that will get you to the airport on time. We’ll pick you up and drop you off at your desired location at the correct time. You don’t have to worry about adding extra time to your journey to park your car or ask a friend to drop you off at the airport when you hire Ohio Luxury Transport. We’ll get you to where you need to go as soon as possible. No matter if you have an extra early five am flight or if you’re flying in past midnight, we’ll be waiting for you outside of the location you requested ready to whisk you home or to the airport. If you let us know beforehand, we’ll even drop you off in another location you’ve requested. As a car transportation service, we aim to get you to and from the destinations you request. Additionally, we’ll arrive on time, so you don’t have to worry about missing your flight. Our goal is to get you where you need to go in style and in a timely manner. We can pick you up or drop you off at a designated location. We’ll depart or arrive at CVG, CMH, DAY, LUK, MGY, or LCK. We aim to make your traveling experience easier when you hire us because we know how stressed out you already are trying to get everything together. We know how troublesome it can be to travel to the airport, which is why we want to take this off of your plate. You have to pay for parking and deal with getting to the airport early, except you don’t have to worry about those little nuisances when you hire us. Now, with our airport transportation service, you don’t have to think about finding a parking spot or arriving earlier than need be. Instead, all you need to concentrate on is requesting an airport transportation service, so you arrive on time. Start your vacation when you hire Ohio Luxury Transport. Prices will vary based on the type of location as well as where you want us to pick you up and drop you off. Depart/Arrive at CVG, CMH, DAY, LUK, MGY OR LCK. Price‎ may vary based on selected vehicle and pickup/dropoff location. Flat rate transfers available. Call or Request a quote on our Reservation/Quote page.